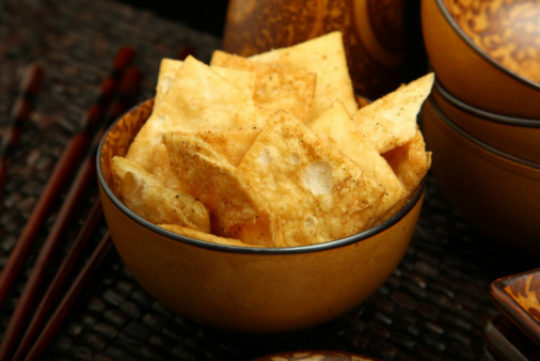 Enjoy this recipe for home-made, healthy pita chips with friends or treat yourself. With only four ingredients and a few easy steps, you can whip these up in no time! 1 Sprouted grain wrap or whole wheat tortillas-cut into 8 triangles. Sprinkle some with Parmesan cheese or cayenne pepper or garlic powder. You can sprinkle with any type of seasoning. Place on cookie sheet and bake at 400 degrees until golden brown. Careful to watch them to make sure they don't burn.